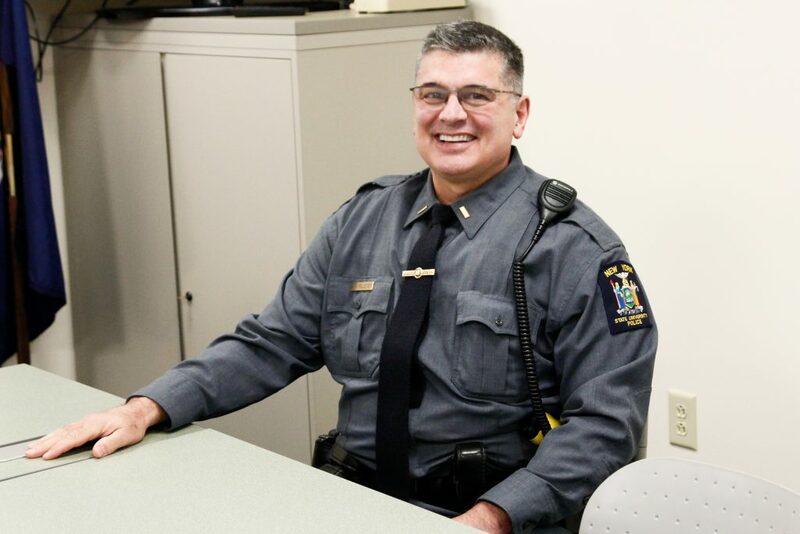 Rose Coschignano/Staff Photographer John Pelletier, currently a lieutenant for Binghamton’s New York State University Police, will replace Timothy Faughnan as chief of police on Dec. 13. Binghamton’s New York State University Police is getting a new chief, and with him could come changes in the department’s approach to campus policing. Last week, BU announced that John Pelletier, currently a lieutenant for UPD, will serve as the University’s new chief of police, beginning on Dec. 13. Pelletier said he wants to get settled into his role before making any changes, but ultimately, he hopes to expand UPD’s Community Response Team. According to Pelletier, he will also be researching new ways to increase campus security. Pelletier said his daughter, who graduated from the University in 2015, gave him an important outlook on his new role. Pelletier, who has been with UPD for 11 years, said he intends to use his experience with BU’s campus to smoothly transition into his new role. He will be the second chief to start his policing career at UPD before being promoted to chief of police. According to Pelletier, he will initially aim to observe police operations and hear feedback from campus community members. “I want to establish myself in the new position and get to know all the people and how we interact in the community,” Pelletier said. Before becoming an officer with UPD, Pelletier enlisted in the U.S. Army at 18 years old, three days after he graduated high school, and served for 21 years. He earned his first leadership position, direct line supervisor, at 19. After retiring from the U.S. Army in 2004, he joined UPD in 2007 with the goal of eventually becoming chief of police. Timothy Faughnan, BU’s current chief of police, will become the University’s associate vice president of emergency services after Pelletier takes over. According to Faughnan, Pelletier is an experienced officer who will bring new ideas to UPD. Although the new chief of police has been selected, not everything is settled. Faughnan has yet to decide what he will do with the @UPDChief Twitter account, which boasts more than 600 followers. The account, which Faughnan created in 2015, may be transferred to Pelletier. However, Faughnan may also choose to change the account name and handle, keeping it as he transitions into his new position. As Pelletier looks ahead to beginning his new role, he said he is excited and nervous.